through extensive consultation with experts beyond ICIMOD, including the National Aeronautics and Space Administration (NASA). Internal requirements were understood in terms of data and products and incorporated in addition to snow products mainly as spin off opportunity from the installation. 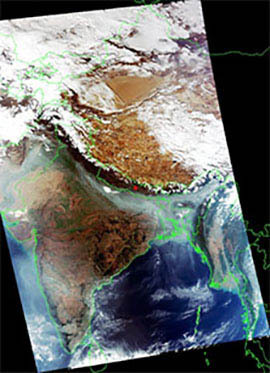 Considering that the MODIS system is nearing the end of its life span, the technical specifications were developed with the view to receive post-MODIS satellite data and next generation satellite data such as from NASA's NPOESS Preparatory Project (NPP). In addition the system is capable of collecting other NOAA satellite data and Fengyun data from Chinese satellite. This system was installed in the first week of January 2013 by system engineers from SeaSpace with assistance from ICIMOD colleagues. Installation of the system had two components: an outdoor unit and indoor unit. The outdoor unit consisted of a reflector (antenna) and radome (protective cover) while the indoor unit consisted of a processing server, acquisition system, and visualization system. The receiving system consists of a 3 m reflector on pedestal fitted with control box (Photo 2). The receiver is enclosed within 5.5 m radome (Photo 4) for protection against wind and other elements. 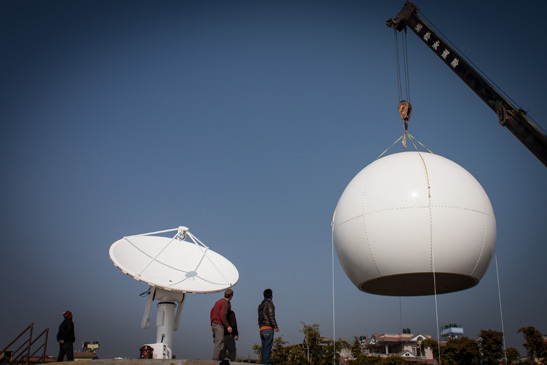 The installation of the radome, completed on 10 January 2013, was a milestone in ICIMOD’s history in terms of enhancing the Centre’s remote sensing capacity. A week after the installation, data was being received and the calibration of the system was initiated. The receiving system is supported by a battery backup in case of power failure. 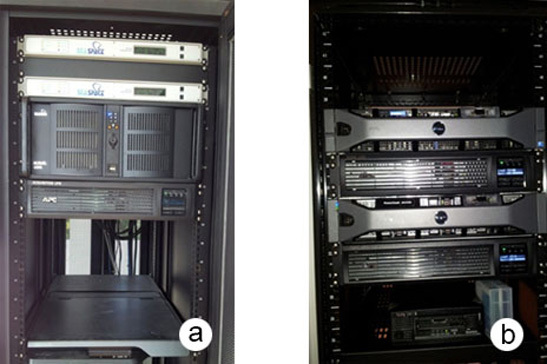 The acquisition system consists of two types of digital signal processing demodulators (Photo 3): a high rate demodulator (HRD-200) and a low rate demodulator (LRD-200). 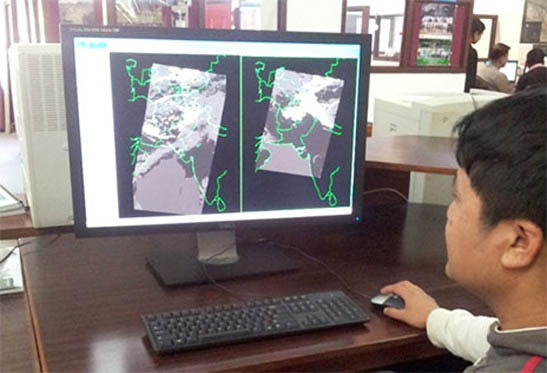 These enable the Centre to receive and process not only MODIS imagery, but also images from other satellites such as from NOAA, Fengyun, and NPP. The acquisition system comes with a battery backup in case of power failure. 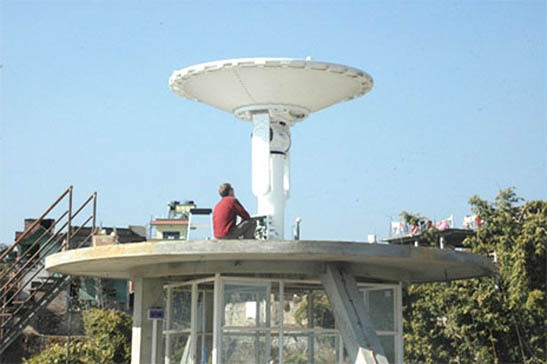 The acquisition system is housed below the radome in order to avoid sharp bends in connecting cables as per the instruction of SeaSpace engineers who oversaw the installation process. The processing system is housed in the Centre’s server room and consists of a server, storage drive, battery backup (Photo 5), and TeraMaster software, which forms the backbone of the processing unit. The system is networked with the acquisition system and visualization system through CAT cables. It is where raw data is processed to generate products that are accessible through the visualization system. A battery backup ensures uninterrupted processing, even in the case of a blackout. The system includes 30 terabytes of storage to meet the storage requirements for large sets of data. The visualization system is the most simple of the components and consists of 30 inch screen (Photo 6) and a computer with normal specifications. It operates TerraVision, a software used to visualize data, products, and other ephemeral datasets. 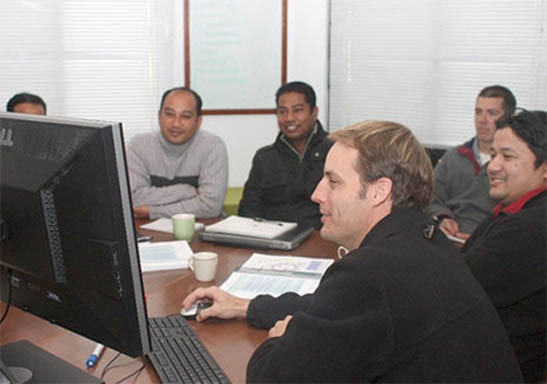 A week-long training (Photo 7) by engineers from SeaSpace helped familiarize ICIMOD professionals with the system. The highly technical training was limited to relevant staff. The first two days were devoted to hardware maintenance and trouble shooting, followed by three days covering system operation and product generation. Product configuration was used with actual working geographical extent to make it more relevant.